After an international career at IBM, Chris Brennan briefly retired before deciding to pioneer sourdough and other breads in Orford, Suffolk. Chris, along with his daughter Joanna, are now crafting award winning chocolate too, and not only do they win awards for the bars and beans, but also for their innovative packaging. Sourdough is an intriguing inclusion. It gives the chocolate a gentle crunch and pleasant yeasty taste that works incredibly well with the salt. This sourdough bar surpassed our expectations and is one of the most moreish bars in the Pump Street range. Cocoa beans, cane sugar, breadcrumbs (wheat flour, natural sourdough starter, sea salt), organic cocoa butter & sea salt. Contains wheat and dairy. May contain traces of nuts. There is something inherently satisfying about a pure bar of unadulterated chocolate. A few really great, high quality ingredients, carefully combined to showcase the natural wonder that is chocolate, has a certain honest beauty to it. It will come as no surprise therefore, when I admit that I’m not usually a fan of Chocolate that has been fiddled with. Cadbury’s is a prime example, seemingly taken it upon themselves in recent years to create more and more excessive combinations of fudge, Oreo, caramel and biscuit mashed together to form horrendous freaks of confectionary. However! 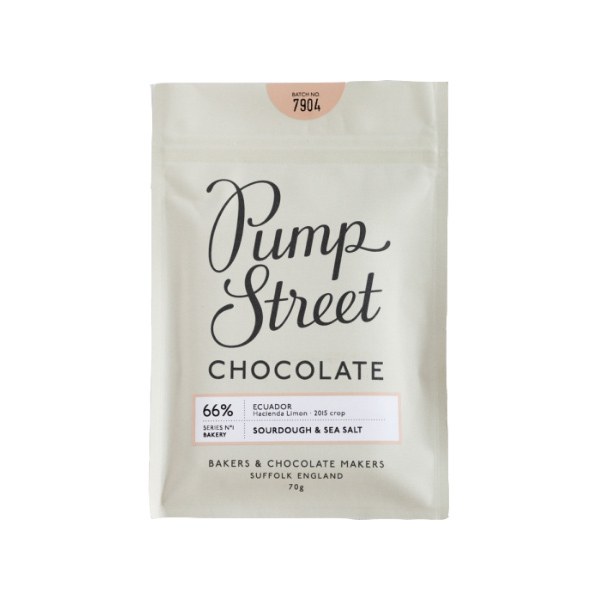 Being the daring individual that I am, I decided to try Pump Street Bakery’s Sour Dough & Sea Salt chocolate… To my delight and surprise, it tasted just like toast. All the flavours of beautiful thick, burnt bead somehow had been distilled into this single bar! A subtle buttery-ness followed, tempered by the Sea Salt. Cocoa notes definitely take a back seat but are still noticeable, and probably responsible for adding the depth and buttery quality to the overall flavour. The flavours of this chocolate are nothing like Nutella on toast. — Admittedly my expectation at first. The bar itself has a lovely crunchy texture. It unapologetically demands biting into, and although doesn’t melt, was not too dry either. It did not feel grainy on the palate and seemed well mixed with no specific ingredient being dominant. Great fun! — This is a delightful chocolate offering childish wonder and excitement without taste or quality being sacrificed in pursuit of novelty. I look forward to trying the other Bread & Chocolate combinations Pump Street Bakery offer. The idea of Sourdough and sea salt in a chocolate bar seemed a bit gimmicky - do not be fooled. This is a brilliant bar of chocolate that is truly unique. One to re-purchase.